Not easy to summarize the rich history of Venice in a few lines ... however, it is always interesting to be aware of the major events that have marked the history of the city that we are visiting. To us then we dive deeper into the periods that excite us. The Venice area has been inhabited since ancient times by fishermen, sailors and salt smugglers. invasions of the Goths of Alaric I and the Huns of Attila in the fourth and fifth century, forcing the local population to gather in the islands and particularly on the island of Venice. The city of Venice is truly founded by the numerous refugees fleeing the invasions of the Lombards in 568. The region remains under the control of the Eastern Roman Empire but its autonomy is growing to achieve independence. The first Doge of Venice, Paolucio Anafesto, embodies the power from the VIIth century. Venice gets around the year 1000 a real city-state. The Republic of Venice is organizing a pyramid with the base and a popular assembly atop the Doge, the two sat the Grand Council, the Forty and the Senate. Venice is enriched with strong trade and constitutes a maritime empire throughout the Mediterranean. In the XIVth century, the most important port in the Mediterranean, his empire spans the Greek and Dalmatian island, Dalmatia, Istria, Bergamo, Brescia, Verona, Treviso, Udine and ... the city expanded over the lagoon. The maritime influence will decline rapidly especially with the increase in Turkey but Venice retains preeminence in Europe in the field of art, architecture and literature to the XVIII century. Annexed by Napoleon in 1797, Venice lost its independence for the first time in 800 years. 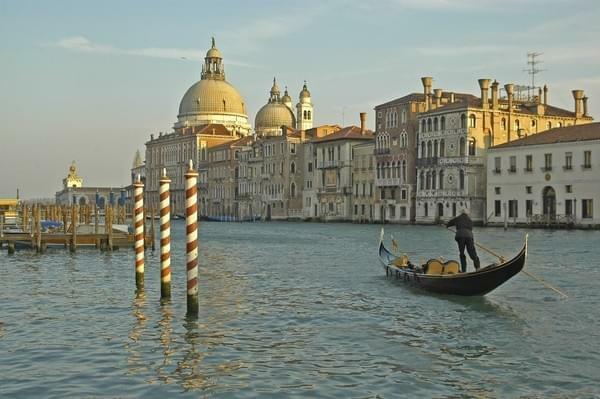 Venice is then integrated into the Kingdom of Italy and became a provincial capital. Venice becomes a tourist destination very early, especially for young aristocrats of the XIX century and is today one of the world's leading tourist destinations.